24 Piece Gold Plated Set For 6 People. Set contains 6 Table Forks, 6 Table Knives, 6 Dessert Spoons and 6 Tea Spoons. The pieces are gold plated onto 18/10 Stainless Steel. Mirror polished. 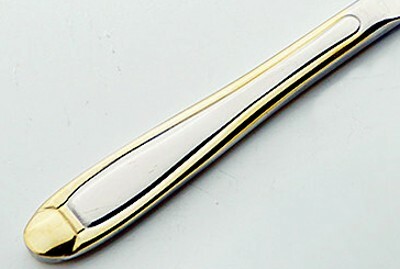 Gold inlay handle designs. They are suitable for dishwasher use but requiring washing any time they are used. Table Knife: 0.5cm thick, 23.4cm long, 1.8cm wide. Weight 99g. 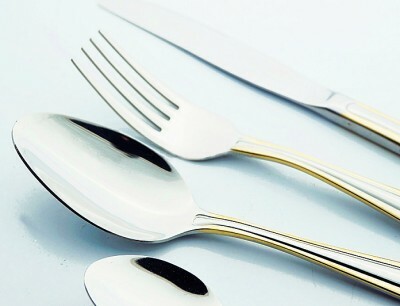 Table Fork: 0.3cm thick, 20.1cm long, 2.6cm wide. Weight 56g. Dessert Spoon: 0.3cm thick, 20.5cm long, 4.1cm wide. Weight 63g. Tea Spoon: 0.2cm thick, 15.1cm long, 3.2cm wide. Weight 32g. Limited numbers - Order Now! The stainless steel is an eco-friendly material and finished with quality hand-polishing workmanship.